Spanish Pod 101 covers 4 different levels of learning Spanish. The levels are: Absolute Beginner, Beginner, Intermediate and Advanced. You will be asked to choose a level when you create your account on Spanish Pod 101, but you can later switch if you consider you need either a lower or a higher one as your Spanish improves. Once you have signed in, you will be directed to the online learning dashboard. Under the My Subscription column, to the left side of your screen, you will see the My Level pop up menu. This can be changed at a later date. The Spanish Pod 101 levels are subdivided to better fit your needs. 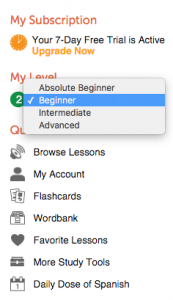 For example, I chose the Absolute Beginners/ Absolute Beginner Season to start, as my knowledge of Spanish is very limited. This will allow you to keep track of how much you are studying and what Spanish lessons you have covered. When you click on the link to the Season Level, you will be able to see all the lessons available at that level and click on any of them. You can then come back at any time to keep practicing and even mark the ones you enjoy the most to replay them as many times as you want. 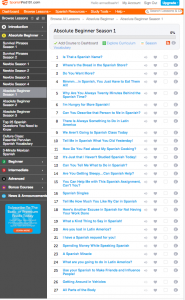 In terms of each level of Spanish Pod, there are more than 200 lessons contained! The levels of Span ish Pod 101 progress at a good speed so that you can ensure you are studying everything at your own pace. Once you are in the level you chose, on the right side of your screen you will see a list of all the subdivisions of that lesson. The Spanish beginner´s lessons include basic dialogues and the most common questions if you were to travel to a Spanish speaking country you would need to know I found that to be extremely helpful as a way to learn Spanish.